For anyone who has battled breast cancer, the threat of recurring tumors is one that no treatment can completely eliminateyet. 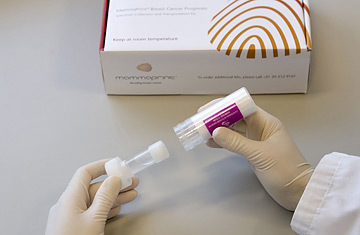 But with Mamma-Print, a genetic test of a tumor's DNA, patients and doctors can get a better handle on how likely it is that the cancer will spread. The 70-gene screen, developed by Amsterdam-based Agendia, is the first test approved by the FDA that measures the activity of genes at work.